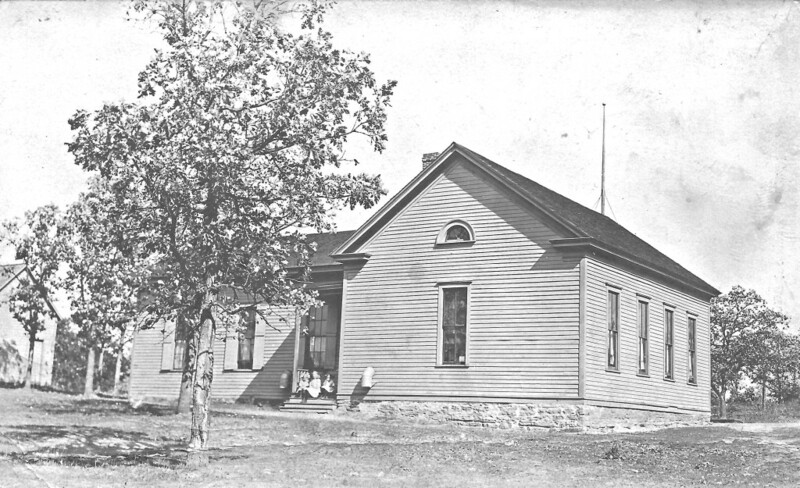 In 1894 the School Board tried to lease a room from the Presbyterian Church of Oak Hill for a school, but it could not be rented for less than $10 per month so they needed another plan. Pratt School on Excelsior Blvd. had been closed in 1892, so it was moved “across the marsh” to the Oak Hill area. The original Oak Hill School was a two room building (6 grades, 2 teachers) located on the corner of North Street and Pennsylvania Ave. An addition was later built to this site. A house at 7600 North Street, built in 1952, is now located at that site. In 1906 the site on the southwest corner of Walker Street and Quebec Ave. was purchased and Oak Hill School was moved to this site. 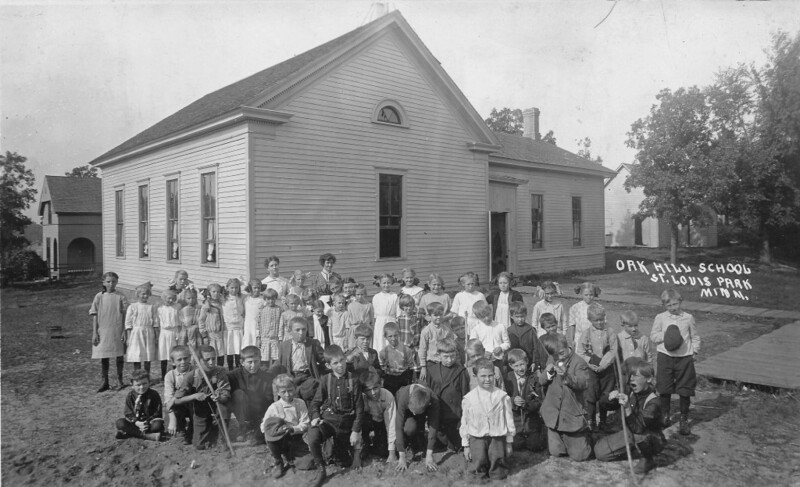 Oak Hill School, 1914. Postcards donated by Frank Heyda. The wooden building was replaced with a new brick building in 1918. That building had two rooms on the main floor and a basement. It faced Quebec Ave. In 1920 the schoolhouse was wired for electric lights. A list of officers indicates that the PTA was formed in 1921 with Mrs. Crosby as the first President and Mrs. Lufkin as the Secretary/Treasurer. The October 10, 1924 issue of the Echo spoke of Oak Hill’s “splendid new building.” This building faced Walker Street. It had three stories, counting the basement. There were two classrooms on the top floor and two on the main floor. Kindergarten was housed in the basement. There was also an office, nurse’s office, and a lunch room/auditorium. There was an external fire escape on the south side. The two buildings were connected by a wide hallway. 1925. The Quebec Ave. building is on the left and the Walker Street building is on the right. Mrs. Halsey Hall was one of the teachers in 1926. Mr. Halsey Hall refereed for Park baseball games. 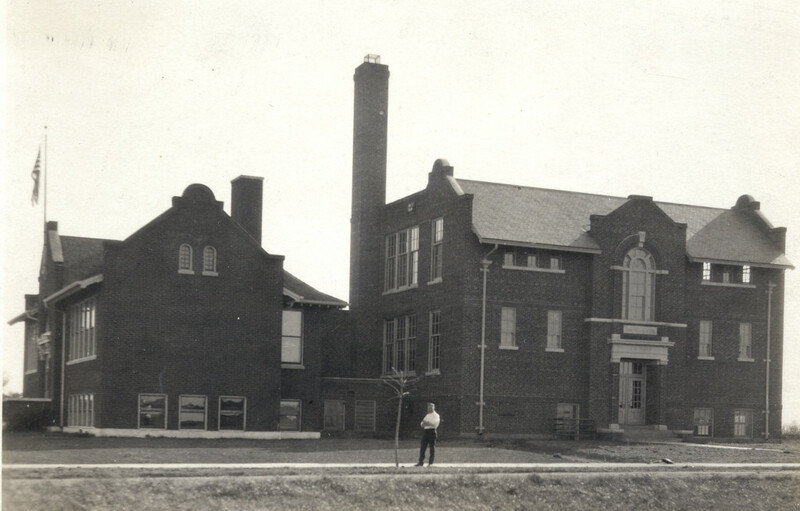 Bill Roberts says, “I was in first grade [at Oak Hill] in 1928 and completed six years, then went to Lincoln School for 7th and 8th grades, and the Walker Street [Central] building for 9th through 12th, graduating in 1940. 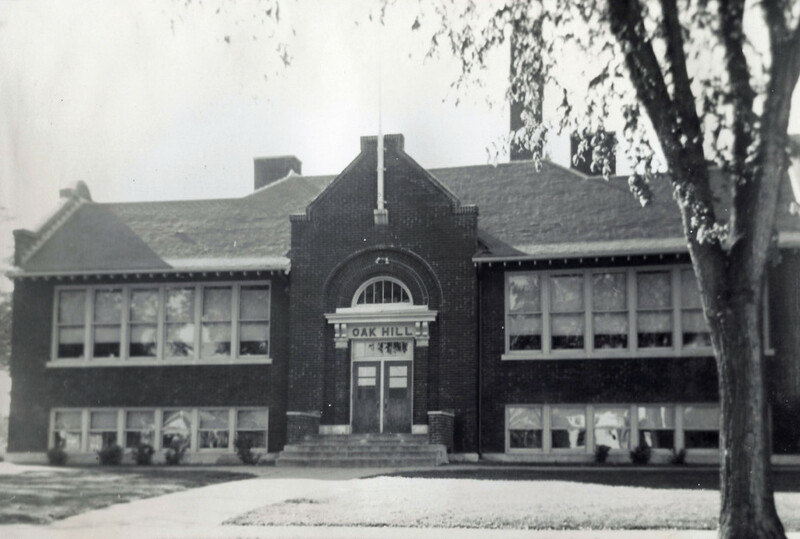 Each classroom [at Oak Hill] had two classes to a room, first and second in one and third and fourth in the 1918 Bldg, with fifth and sixth in the 1924 addition. Teachers were 1 & 2 Mrs. Dakin, 3 & 4 Miss Lindqwist, and 5 & 6 Mrs. Weylander. Special Education was on the second floor and we were not allowed to go up there.” Bill remembers that every morning the children would line up in front and march in to a record of “Stars and Stripes Forever.” He was also proud as punch to be in the school patrol, helping kids cross Highway 7 as there was no stop sign. Police Chief Andy Nelson was also there every morning and afternoon to help kids cross. The PTA of 1935-36 consisted of 25 members. The group secured a “Caution” sign for Highway 7. 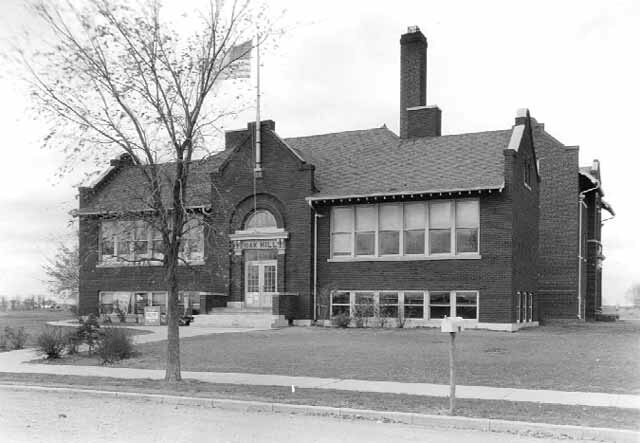 In 1946 the school only served grades K-3. In 1952 Park Knoll School was built, and Oak Hill served only grades 1-2 and a “trainable class.” Instead of forming its own PTA, Park Knoll and Oak Hill had a joint organization. 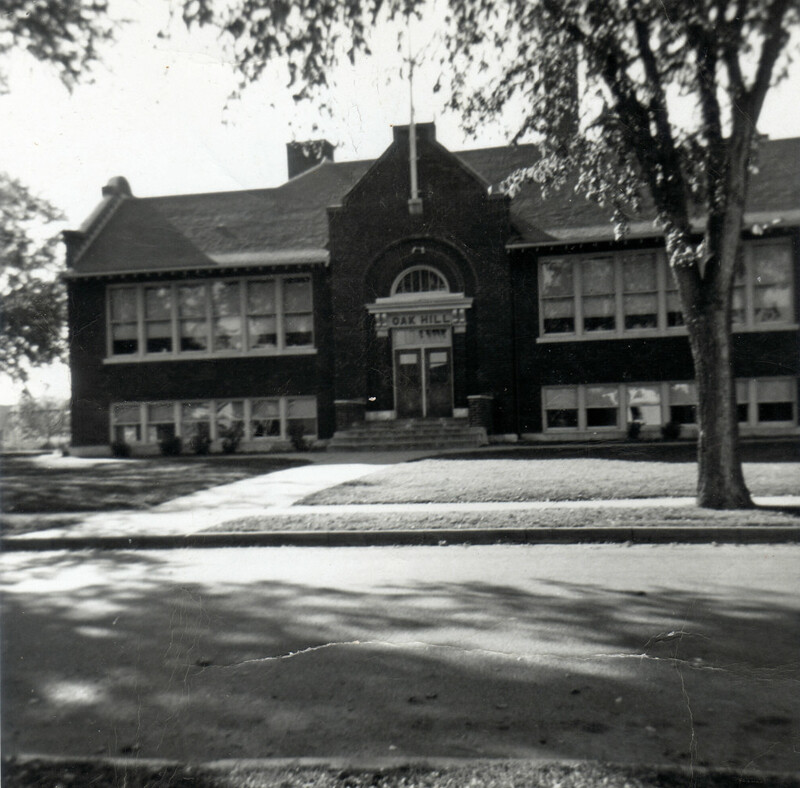 See our separate page on the activities of the Oak Hill-Park Knoll PTA from 1952 to 1963. During those years, Luella Butler was the Principal of Oak Hill School. In 1955 there were about 100 students at Oak Hill. In the 1960-61 school year there were 130 students, compared to the 694 students in the K-6 Park Knoll. Oak Hill was transformed into offices in 1972 and the school was decommissioned altogether in 1974. It was demolished on August 28, 1975. The granite “Oak Hill” sign that graced the doorway of the 1924 building is now at the Depot. Duplexes now occupy the site.